Water is not limitless. Find out how to conserve water usage. What we did to reduce natural gas usage. Go after the largest energy users first. Find out what solar on a house means and how it works. Selecting a car that has better MPG. Are EVs better than gas cars? YES! Various choices for EVs and PHEVs. Why I drive a Tesla vs other electric vehicles. The most popular questions about electric vehicles. The most frequently asked questions answered here. Feel free to download the 2-page pdf file by clicking the link below. 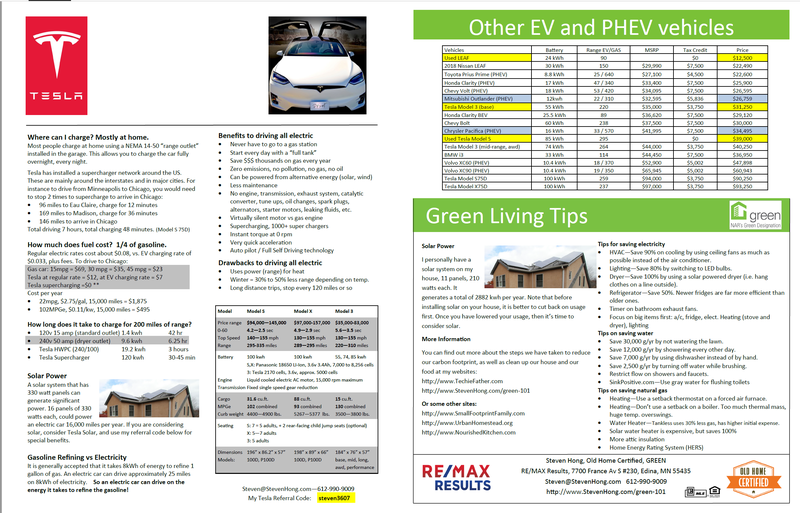 If you have any questions about electric cars, contact me now.